Net Weight: 25kgs/drum. I.D. 40CMX50CM. 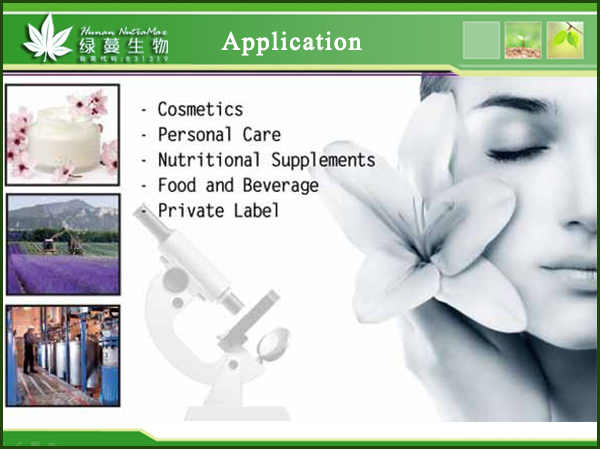 What is Vine Tea Extract produced in Hunan NutraMax Inc .? Vine tea, also be called as dragon-boat tea, dragon-whisker tea, young stem and leaf from Ampelopsis grossedentat , a plant of (Ampelopsis grossedentata)(Hand-Mazz)W.T.wang, growing in 1300-1950m hillside shrub or valley woodland , always be consider as legendary healthy tea. Researches show than vine tea can relieve inflammatory, mixture cough and antitussives, it also has strong inhibitory effect to common bacteria can be found in food. 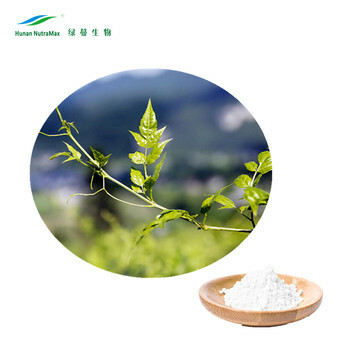 Some of flavonoids, for example Ampelopsin and Dihydromyricetin, are main active ingredients in vine tea, which have almost same MIC and MBC comparing with berberine, and have high Free radical scavenging activity varies between 73.3~91.5%. 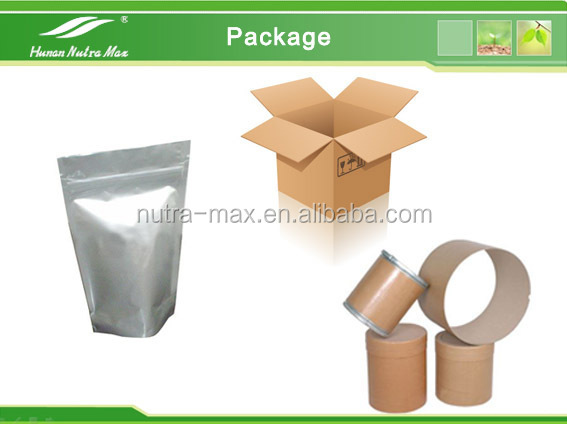 It can also reduce oxidative damage in the body, anti-aging, reduce the deformation and tissue necrosis of animal liver. 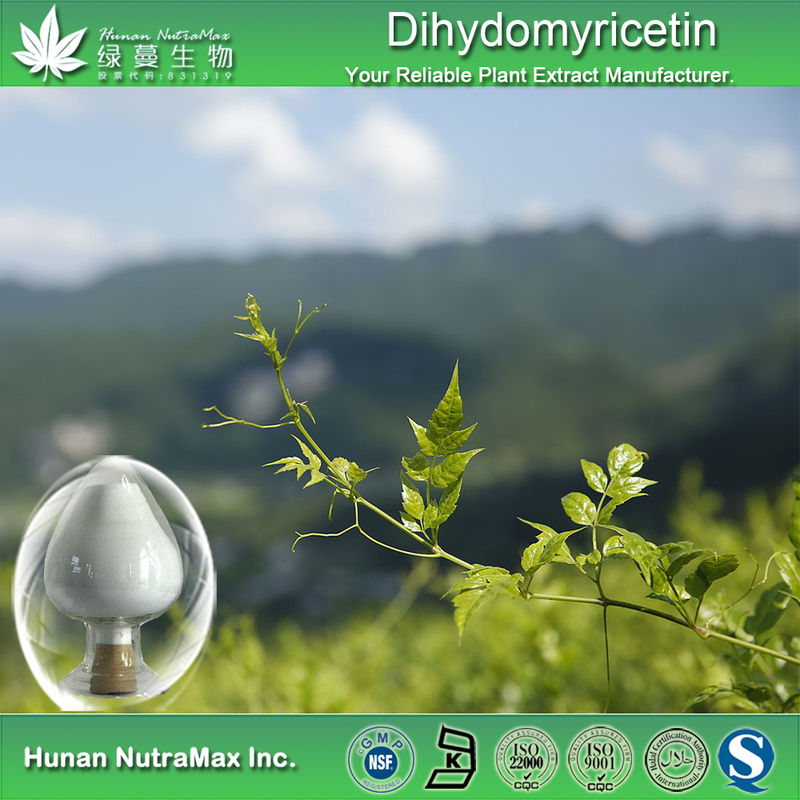 Dihydromyricetin also have ability on lifting alcohol poisoning, prevent for AFL, Inhibit the deterioration of liver cells, decrease the incidence of liver cancer. In these case Dihydromyricetin is consider as a good product for enhance activity of SOD, protecting liver and removing inebriation. Dihydromyricetin now entered clinical trials as a class of new drugs when researcher of Dihydromyricetin achieved a major breakthrough in field of anti-leukemia and medicine of Nasopharyngeal cancer. Ampelopsis injection is expected to be a new treatment for leukemia and nasopharyngeal cancer. 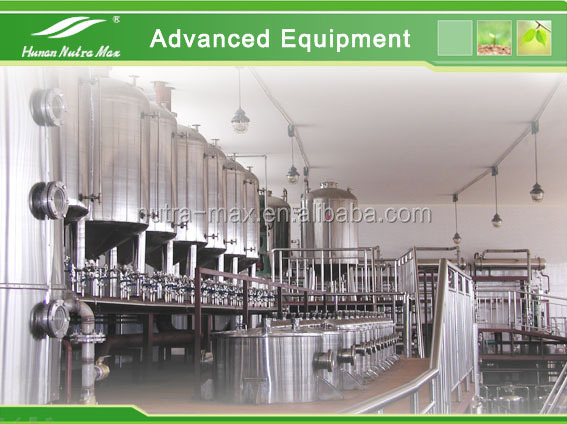 What will Vine Tea Extract be used for? 1)Clearing the free radical in body and antioxidation. 4)Reducing the levels of blood sugar and blood fat. Delivery Time: Around 3-5 workdays after your payment. Package: In fiber-drums with two-plastic bags inside. 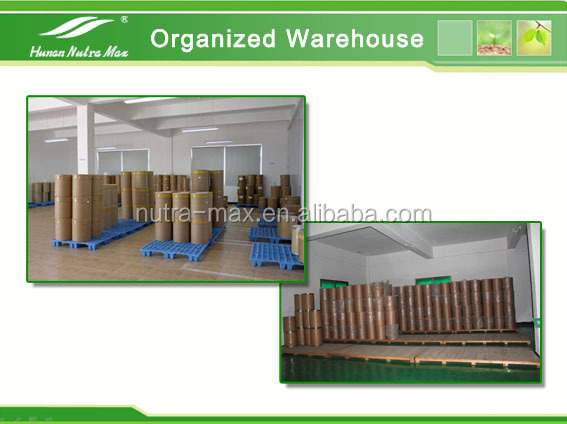 Storage: Stored in dry and cool place, keep away from strong light and heat. Shelf Life: Two years when properly stored. 4, Please confirm if you can make the clearance when goods reach your customs before placing an order, for buyers from Mexico, Turkey, Italy, Romania,Russia, and other remote area. 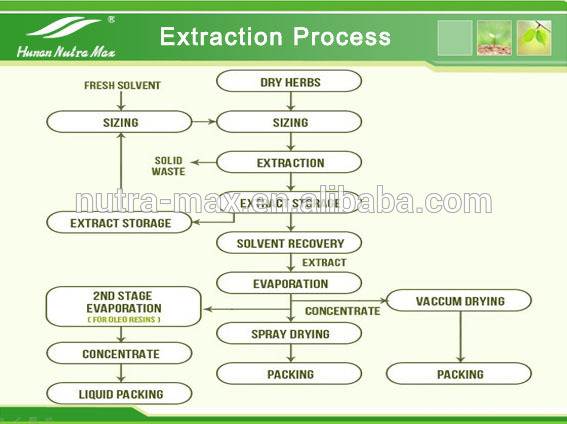 Factories: Hunan Nutramax Inc. hold 2 factories for professionally producing Botanical /Herbal Extracts, located in Hunan and Guangxi Province.The total annual production capacity of herb raw material is 9000mt, we can supply more than 800mt Botanical Extracts one year. 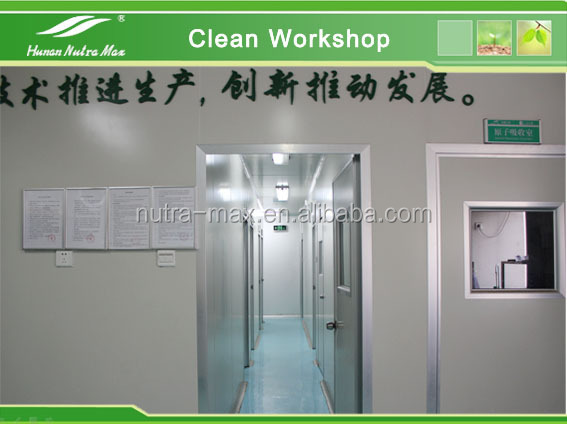 Our factory have passed ISO14001, Kosher, cGMP, The production departments are equipped according to the GMP standard with all of our product line, such as distillation, extraction, chromatography , desiccation, packing. 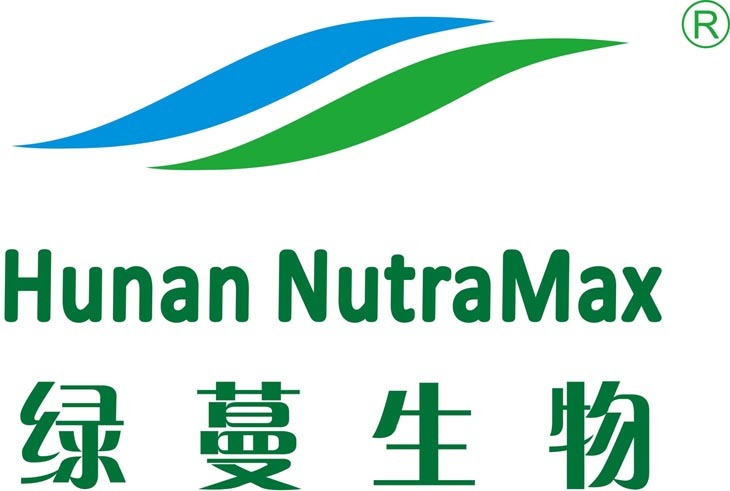 Research & Development: Hunan Nutramax Inc. has a strong R&D team of over 42 scientists dedicated to developing innovative ingredients to meet the market demand. 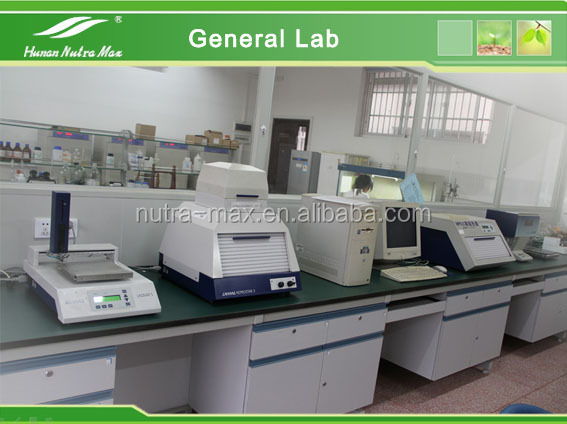 And our R & D center cooperating with cooperating with Hunan Agriculture University, Hunan Engineering & Technology Research Center for Natural Products. Most of the scientists are PhDs and/or Professors; or Masters in Phyto-Chemistry, Pharmacology and Traditional Chinese medicines. 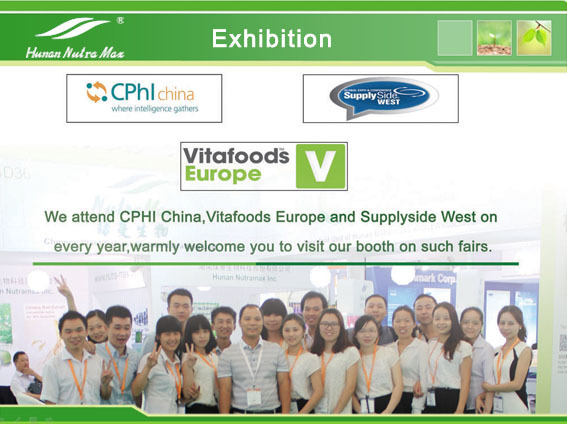 Coupled with our sophisticated apparatuses, we can effectively develop the customized ingredients to meet and exceed our customers, expectations. 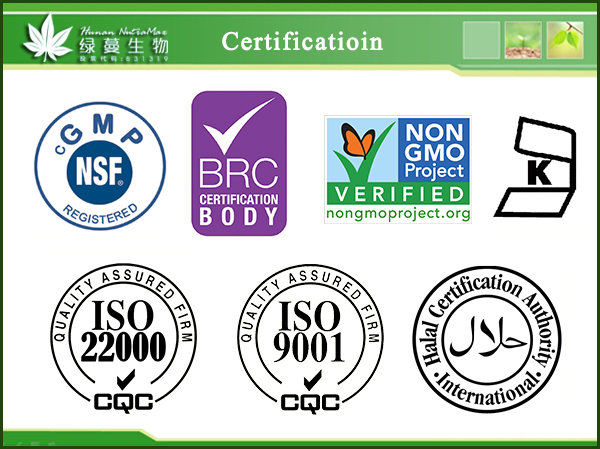 Certificates below are authenticated by trusted third parties.